Making the Hot Chocolate from the refrigerated mix, or maybe “batter” would be a better word than mix, just couldn’t be easier. It’s really just a ganache with a little corn syrup in it to help it hold up to the refrigerator temperatures without totally hardening or even worse, crystallizing from using a granulated sugar. If you’re opposed to the corn syrup (there is a difference between the high fructose corn syrup and regular grocery store corn syrup) use agave or any sweetener of your choice. I came across this Refrigerator Hot Chocolate Mix by way of a happy accident. When I made my Chocolate Glazed Tart not too long ago, I had to make the glaze twice. I messed up the measurements in the glaze but I wasn’t going to waste all that chocolate. That’s when I decided it would be the perfect thing dropped by the teaspoonful into steaming hot milk. Yep. I just popped my mug of milk in the microwave and when it was piping hot, dropped in the chocolate ganache by the spoonful until I thought it was chocolaty enough. After the chocolate is refrigerated, it will be quite a bit stiffer but still melts in with no problem. There’s really nothing to making Refrigerator Hot Chocolate Mix. Heat the cream in a heatproof container in the microwave or in a pan on the stovetop. Allow extra room in whatever container you use because the cream can boil over easily. When ready to use, just add by the spoonfuls to warm milk. Or any other warm beverage of choice; maybe coffee? If you’d like to use this chocolate in a cold drink, just heat the Refrigerator Hot Chocolate Mix until it’s pourable. Store in the fridge where it will keep for weeks. While chocolate chips are fine as the chocolate in Refrigerator Hot Chocolate Mix, keep in mind that the better chocolate you use, the better the hot chocolate will taste. Go ahead and splurge if you want to. And keep this recipe in mind if ever you should end up with extra ganache from any other recipe you might make. I often use chocolate chips for the chocolate and I don’t really do it so much for cost savings, although chips probably are a savings over some of the other options. I use them because I usually have them around. If you’re looking for better chocolate, Aldi has a couple great bars; they’re oversized candy bars but I often use them for baking (and eating) and of course, you’ll find great chocolate and other gourmet items at Trader Joe’s. I buy cream often around holidays when it’s usually on sale (sometimes not advertised) or at Aldi. Generally, on sale it’s up to 1/2 off, but Aldi prices often beat the grocery store sales. Cream with its high-fat content keeps literally for weeks in the fridge unopened. This recipe uses 1/2 a cup so if you buy a cup of cream, you’ll have half to whip up to top of your hot chocolate. If you have leftover whipped cream, dollop or pipe it out on a plastic wrapped sheet tray and freeze it. See Whipped Cream for the Freezer. It’s kind of fun to put a dollop of frozen whipped cream on top of hot chocolate and watch it melt. People freak about corn syrup but do keep in mind that there is a difference between corn syrup and the commercial high fructose corn syrup. Wipe the lip carefully before you seal it up and it will keep, literally for years in the cupboard, even after it’s open. Place chocolate in a heatproof cup. 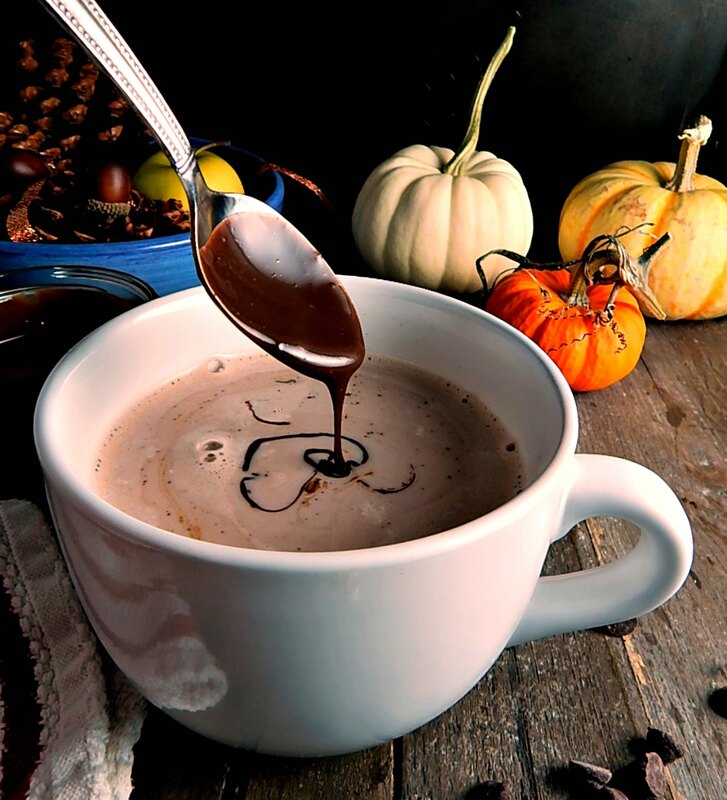 Bring cream to boil on the stovetop or in a microwave, remove from heat and pour over chocolate. Let sit for two to three minutes, then stir until chocolate is melted. Add corn syrup and stir in. To use, add by the spoonful(s) to warm milk, using as little or as much as desired. Garnish as desired. Store any extra in the fridge; this has a very long shelf life and should be fine for several weeks. I’ll be posting Refrigerator Hot Chocolate Mix at Fiesta Friday #253, co-hosted this week by Liz @ Spades, Spatulas, and Spoons and Mila @ Milkandbun. This entry was posted in Click here for Fabulous Food Posts and tagged Beverages, Chocolate, corn syrup, Cream, hot chocolate, milk. Bookmark the permalink. Perfect for those weekend lattes. We use a powder now, but it just doesn’t hit that Starbucks mark and I’m thinking your Refrigerator Hot Chocolate Mix will do the trick. I rarely drink coffee so my mind wasn’t tuned to thing about lattes. This would be a fun addition to coffee or in lattes! 🙂 Great idea, Ron – thanks! I’d rather hoard it all to myself, lol!! Thanks Mila, and thanks again for hosting FF for us. YUM! And I’m not a sweets eater, but this sounds luscious. Perhaps a shot of Kahlua or Bailey’s might add a nice adult kick? Sounds great for the holidays. Hope your shoulder gets better soon! Chronic pain is the worst, and I’m sure the cold weather doesn’t help much. Oh my gosh, I’m a sucker for BOTH Kahllua and/or Baileys. Remember the B-52’s from the 80’s I think. I just checked them and they’re listed at kahlua, baileys and grand marnier but we used to make them with Frangelica instead of the Grand Marnier. I think the cold is like a free ice-pack, lol!! I love it! Our kids go through hot chocolate like you wouldn’t believe. How is your hand doing? Thanks for asking. Quite a bit better but not normal; The hand specialist said come back in two weeks. Since I got a cortizone shot in my shoulder he doesn’t want to do anything with my hand. Will they send you to physio? I’ve had to do that in the past. I did get a cortisone shot in my hand last year. Boy did that hurt! I think probably so…there seems to be a method that Docs go through for almost every injury. You go in get X rays. They tell you to ice and elevate. You come back, they give you a shot of cortizone. Then you back, and a) give you an mri or b) send you to therapy! And if they send you to therapy they do that for five weeks or so, then send you back to the doc where a) you get an MRI or b) you get another shot of cortizone! It must be a “formula!” I’m a little worried. Sounds like a merry go round there! Geez. After your comment, I added to hide this from your kids, lol!! My son and his friends, when they were in high school, figured out they could get free coffee and hot chocolate from a car dealership that’s across the lake! They’d walk along the shore or swim across and go in and help themselves… They eventually got kicked out and “banned”! I only found out afterward!